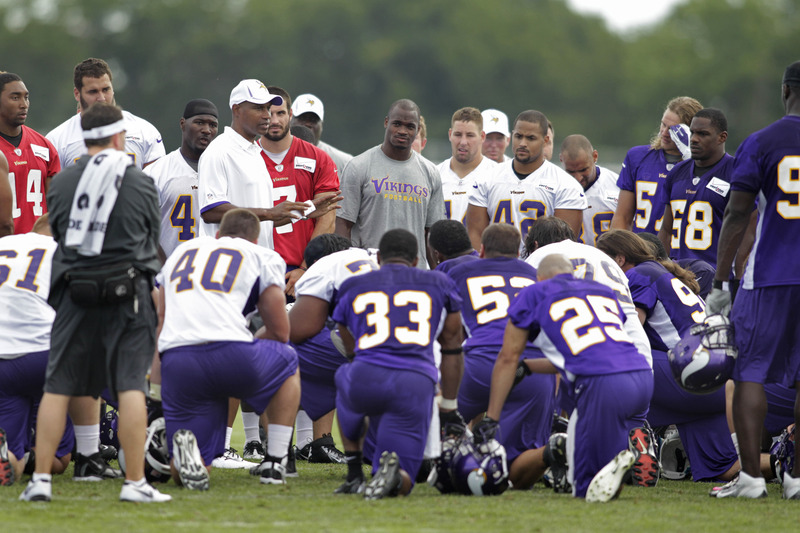 Vikings Corner: What offensive formations are we seeing at Vikings training camp? What offensive formations are we seeing at Vikings training camp? As training camp has begun, many fans are "pondering"the type of offense the Vikings are going to run this season. Last season during training camp we seen many double tight end sets being practiced. The season came along and we rarely saw the tight ends utilized in game situations. As this season rolls along, many fans would expect to see many "two-tight" end sets, with the addition of John Carlson to Kyle Rudolph. We haven't seen the tight ends used as much as last season. Maybe this means that we will see more tight end formations during the actual NFL season. So you may be asking, what are we seeing from the offense in Mankato? The Vikings are primarily working on short, intermediate routes involving the running backs and fullbacks in the backfield. I like this, but feel like it will be too conservative during the season. I like to have a change in pace by involving the running backs, but hope this isn't used in games because it is too predictable. We have also seen the Vikings spreading the field more than at any training camp I have been around in the past. We now finally have the personnel to run "5 wide receiver" sets during games. The only worry I have is that we will become to conservative with the "five wide receiver" sets. The majority of the plays ran at training camp have been rather short and have been mainly across the middle of the field. Hopefully we establish the middle of the field and then take a shot deep once the defense is streched out. With the addition of Jerome Simpson as a deep threat and Greg Childs along with Jarius Wright, we have more flexibility to be a threat in the passing game. Hopefully we can have a passing attack like we had during the 2009 season. The Vikings have been installing running plays between the tackles and we haven't seen much running off the tackles. Jordan Todman has looked impressive running inside. Yes, he is small, but is elusive and is very difficult to bring down. I really liked him when he played at Conneticut and think he is the answer as a third sting running back. Overall, the offense hasn't installed enough formations for us to clearly see what the Vikings offesne will look like this season. We will post another Training Camp Chronicles after tomorrow's day of practices.